Purslane. My new favorite edible weed. If you missed my post on just how incredibly nutritious this herb is, you’d better go catch up! After discovering this super food in my garden, I decided to let it go crazy in one of my empty raised beds. And boy did it go crazy! I had fun experimenting with it before it came time to clear out the bed to make room for my new raspberry bushes. Purslane makes a great thickening agent, much like cornstarch. Here’s how to turn it into a super-food powder to add to your favorite soups, stews, gravies or even shakes! First, pick a bunch of healthy looking purslane. I like to pick herbs early in the morning before the sun has come out and dried the leaves. Wash the leaves well. You wouldn’t want any dirt or bugs in your powder. Then spread them out onto a towel to dry. Pull the leaves off of the stems, and place them single layer on a dehydrator rack, or on a cookie sheet if drying in the oven. This would make a great activity for children to help with. Discard the stems, or feed them to your chickens. You’ll need a mesh screen or something similar to keep the leaves from falling through the trays after they’ve dried. I used the ‘fruits and vegetables’ drying setting on my dehydrator, since these leaves are very succulent. That temperature is 135*. If using an oven, set it to the lowest setting possible, and keep an eye on the purslane to make sure it doesn’t burn. It took about 12 hours to dry completely. It should be brittle, indicating that it is done. Next, place the dried leaves in a food processor or blender, and process until it turns to a powder. Mine turned out to be a course powder, but that was just fine. I stored it in an empty spice jar. You’ll need a lot of purslane to make a significant amount of powder. The first time I experimented with this process, I only filled one dehydrator tray with leaves; I got about 1 1/2 Tbsp of powder from this amount. The flavor of the dried purslane reminds me of dried parsley. It’s very mild and nice. I used my powdered purslane in a bean soup last night in the place of cornstarch, and it thickened up very nicely. I am anxious to make a lot more for regular use in my kitchen. Have you ever dried purslane? What’s your favorite way to use it? 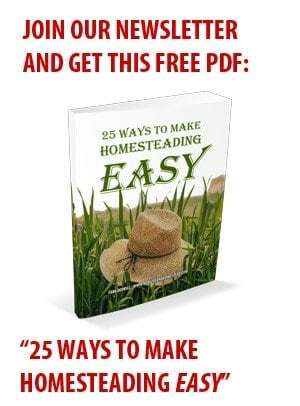 How To Homestead Wherever You Are. 45 Ways To Get Started Today! Use window screen for small items like purslane and sunflower seeds. It will prevent it from falling through. I bought the seeds from Mckenzie seeds and its growing beautiful. I use it every day in my salads. I need to know how to preserve it now. I will try drying it and make powder. I would love to have the recipe for the relish?????? I bet it is delicious. I’ve been weeding purslane for years. Not anymore! Just discovered how great it is. I already make a number of powders (zucchini, pumpkin, spinach, mushroom, chive) and now I can add purslane. I’m excited about this! I eat it fresh on salads, a nice lemony flavor. I also eat and dehydrate the whole stem and leaves. Why throw it away. There is a great Mexican dish called verdolagas (which is also another name for the purslane). It calls for tomatillos, serrano pepper, some onion and garlic, and some optional cheese. After you cook it, you eat it in a tortilla. Really good. I have soooo much purslane in my garden right now. I’m trying to process it every which way I can so it doesn’t go to waste or seed. I even have pickled some. There is a great book called “The Wild Wisdom of Weeds” that talks about the 12 or so edible weeds that are found anywhere in the world. Purslane is one of them. It’s a great book to have. I also have the book you recommended. It’s one of my favorite foraging books! how do you pickle it? I have acres of it. Jamie Oliver has a great recipe for Purslane Pesto…!! I pick a large handful of fresh purslane in the morning, rinse and throw the whole bunch in the Vitamix and make a green smoothie. Stems and leaves. I’ve been cutting off the roots just because I’m not 100% sure they’re good for you, (but I’ll bet they’re fine!). Next thing I’m looking for online is lacto-fermenting it – but this page looked interesting too – thanks for sharing! Does this work for portulaca too, since they are cousins??? Not sure about that one, Nancie. Sorry! purslane is a wild portulaca. Not like the flowering portulaca, but related. I think you could dry the purslane without having removed the stems, and then remove the stems after it has dried. That way the thing you’re drying would be bigger and you wouldn’t need to worry about little things falling through. Incidentally, something I read said the stems are edible too. Also, I have dried slices of zucchini (with seeds removed) and then ground it up into a powder to use in soups, and this worked well. This is the same process I used with the zucchini. Before drying my purslane, I steam-blanch it (stems & all) to stop enzyme action & more importantly to soften cell walls of stems for better drying in my dehydrater. To steam it I use a spaghetti-pot steamer & steam for 45 – 60 seconds, then run under cold water to cool rapidly, then into dehydrater at 115 – 120 deg setting for 24 hrs or until brittle enough to grind into powder or flakes……. I also usually put early-growth purslane “weeds” in with my pots of vegetable plants ( tomatoes, peppers, cauliflower, cabbage etc. grown in pots ) to harvest through-out growing season for an almost continous supply….. A “great beneficial weed ” ! Do you know if sun drying or drying purslane at a low temperature preserves the essential oils or are they ruined by any drying? I don’t really know. I would imagine the oils are mostly lost during any drying, though that would just be a guess. Sorry I’m not much help! I discovered purslane in my garden this year (2nd yr garden). I have given it and lamb’s quarters an area in the garden just like the other veggies and herbs. Otherwise they get kinda pushy! I didn’t know if it would dry hanging upside down like I do with most all my herbs. It is drying now and doing beautifully. In fact, the whole plant, stalk and all is still perky. The leaves are flat and deep green rather than puffy and succulent. I hung it a little over a week ago. I just pulled it out from the root (like, do I need to worry more will be there?) and hung it upside down in a mostly shady, dry spot. I found that it will turn black in the frig after about three days in a mixed salad though so heads up there (summer abundance management!). Drying it so was excited to find you blog. Why do people spend money on that stuff? Any thoughts on drying in sun or drying the stem too ? Do you have a favorite recipe for a salad w purslane? You can eat/dry the smaller stems, just don’t use the very thick main stems. I’m sure you could dry it in the sun, it would just take longer than in an oven or dehydrator. As for recipes, I love tossing it into scrambled eggs and cooking slightly, or putting fresh leaves/small stems in a regular ol’ garden salad with homemade italian dressing 🙂 Have fun! I used ,the stems to make relish found a great recipe. Sounds awesome! That’s great that you can use it for corn starch! Our purslane did really well this spring, but got eaten up the rest of the year. I kept thinking another plant would pop up and take the last ones place and better that than our other more “prized” veggies, but the new plants kept getting eaten too. I do still have a bag in the freezer, although I don’t think it’s enough to make much dried. I should probably just use it as is in soup or stir fry. Thank you for your awesome suggestions! Good way to not have gmo corn in my food, using purslane instead of cornstarch. Would love to be able to try this. Maybe if I find any and get the courage to do so. I am always afraid I will miss identify something, and someone may get sick. It’s definitely important to correctly identify a plant before consuming it, but don’t be intimidated! Purslane is one of the easiest things to positively identify 🙂 The internet is a wonderful source for helping one to identify a plant through close-ups and thorough descriptions. You can do it!! Oh my goodness…we have this in our flower beds already! (I just read the post from back in May.) Hubby has been trying to kill it all year! So…I will pull some up and put them in a planter to grow in a more confined area. Again – THANK YOU! We are on a grain/dairy/sugar-free diet and this would be great to use in place of cornstarch! Hubby likes gravies and thick soups. I will have to find out where to get some to plant next year to dry. I sure wish I would have known about this during the summer! We just moved to our new farm but our old place had a ton of Purslane and Lamb’s Quarter. I hope we have some here but so far we haven’t seen any. Maybe next year when we get the garden going. I’ll definitely keep this in mind. Thanks!